There has been a phenomenal growth of interest in Mother Jones in her native Cork and throughout Ireland since we first announced we would be commemorating her with the Cork Mother Jones festival which takes place from 31st July to 2nd August. There has also been growing interest in the event and in Mother Jones’ Irish roots across the Atlantic and we have had plenty of traffic on this site from the United States and Canada. 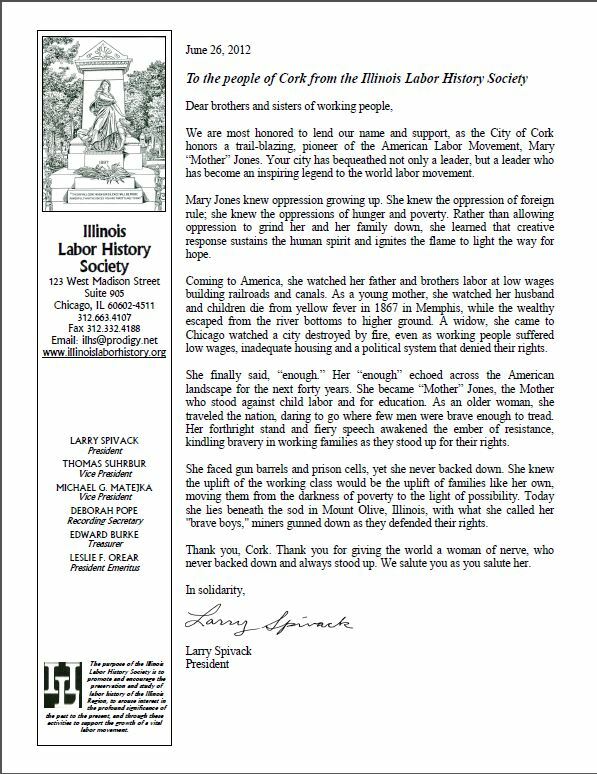 We are most honored to lend our name and support, as the City of Cork honors a trail-blazing, pioneer of the American Labor Movement, Mary “Mother” Jones. Your city has bequeathed not only a leader, but a leader who has become an inspiring legend to the world labor movement. Mary Jones knew oppression growing up. She knew the oppression of foreign rule; she knew the oppressions of hunger and poverty. Rather than allowing oppression to grind her and her family down, she learned that creative response sustains the human spirit and ignites the flame to light the way for hope. Coming to America, she watched her father and brothers labor at low wages building railroads and canals. As a young mother, she watched her husband and children die from yellow fever in 1867 in Memphis, while the wealthy escaped from the river bottoms to higher ground. A widow, she came to Chicago watched a city destroyed by fire, even as working people suffered low wages, inadequate housing and a political system that denied their rights. She finally said, “enough.” Her “enough” echoed across the American landscape for the next forty years. She became “Mother” Jones, the Mother who stood against child labor and for education. As an older woman, she traveled the nation, daring to go where few men were brave enough to tread. Her forthright stand and fiery speech awakened the ember of resistance, kindling bravery in working families as they stood up for their rights. She faced gun barrels and prison cells, yet she never backed down. She knew the uplift of the working class would be the uplift of families like her own, moving them from the darkness of poverty to the light of possibility. Today she lies beneath the sod in Mount Olive, Illinois, with what she called her “brave boys,” miners gunned down as they defended their rights. Thank you, Cork. Thank you for giving the world a woman of nerve, who never backed down and always stood up. We salute you as you salute her.